Randall is an art scholarship recipient of Iowa Central Community College. 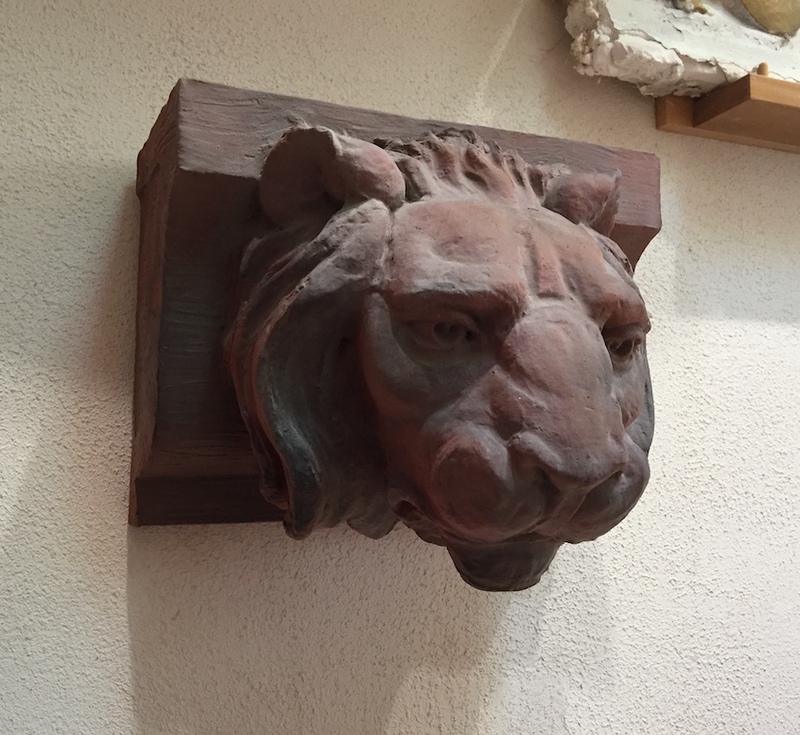 ABOVE- Photos of my casts of this sculpture in a weathered red terracotta finish and a buff yellow finish. This is an interior display sculpture, kiln fired red terracotta for the garden may be available later. I offer several different finishes. They vary from piece to piece, and actual colors displayed on your monitor will vary as well. The samples below display the more popular interior only finishes, as well as the hand-pressed kiln fired red terracotta which can be displayed either outdoors or indoors. Note that the terracotta is ONLY available in brick red. Prices include shipping and are shown on each sculpture on the CART PAGES. The majority of my larger sculptures are shipped in custom built CDX plywood crates, smaller sculptures may ship double boxed instead of a crate. 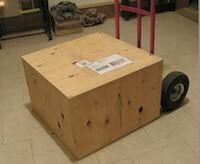 You will need a #2 square drive bit or large phillips driver to open the crate. I use FEDEX ground service for all shipments in the lower 48 states. I do not ship outside the USA. My standard cast-stone is for INTERIOR OR UNDER A COVERED PORCH ONLY! Out in the garden they might last 4 or 5 years, maybe longer before showing weather damage. 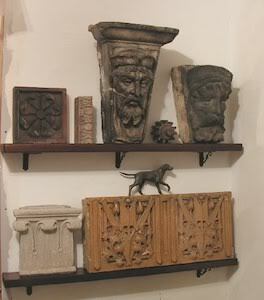 If you are looking for something for the garden or to build into a wall, I offer a growing number of hand-pressed, kiln fired red terracotta works. for many reasons, concrete is no longer available. All of my interior sculptures have a heavy wire embedded on the back to hang them on the wall. The clay models shown in my various work in progress photos are not molded off of existing antique pieces. These hand sculpted models are created from scratch by Randall in water based clay, and typically take an average of 20-30 hours to set up, layout and sculpt each master model. When the clay models are finished, they are permanently captured with silicone mold compounds which can pick up even a fingerprint and faithfully transfer it to a cast made in it. 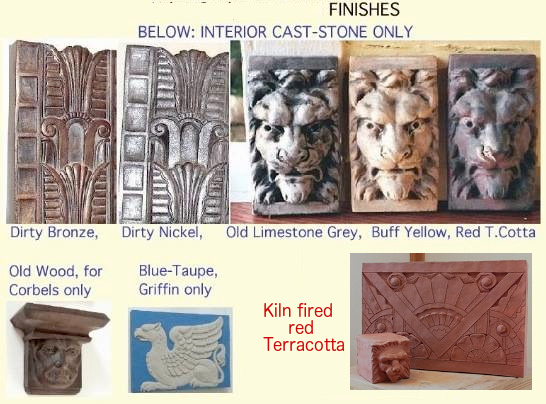 From the molds, interior cast-stone as well as a growing number of kiln fired terracotta sculptures are made available for clients to purchase. 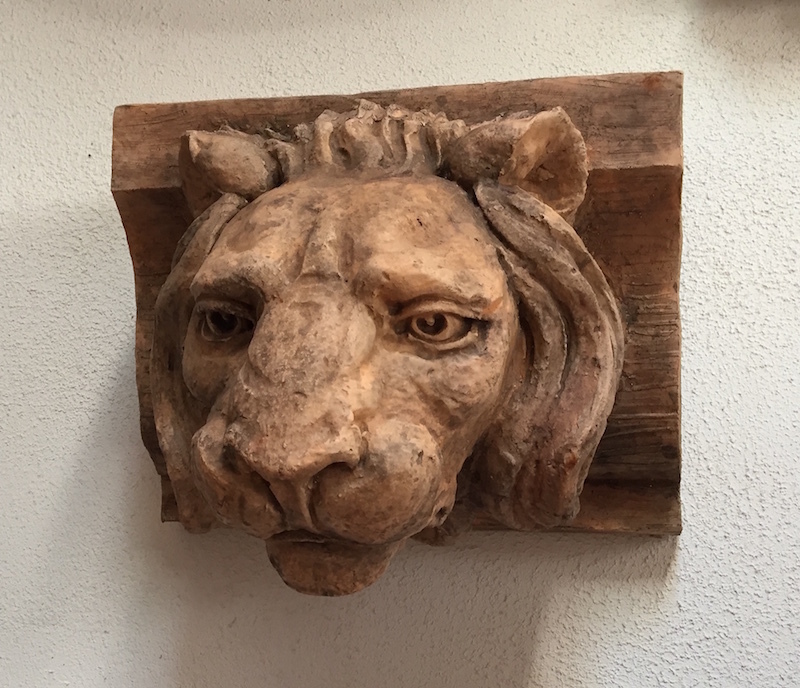 Existing savaged pieces are limited to what happens to be for sale at high prices, often damaged, rarely found in pairs and being typically large in scale (meant to be seen from the street from 5 floors below) they are difficult to display in today's smaller homes and apartments. Instead of making molds of these pieces, Randall creates new original models based on authentic 19th century and early 20th century Victorian, Art Deco and Louis Sullivan style architectural sculptures. While I do have a small number of older designs directly molded from antique pieces, these are being phased out over time as I create my own original models. Designs in the Collection are copyright, this includes reproductions of antique pieces upon which I made certain modifications, alterations or changes- the changes are copyright. I reserve the right to decline sales to anyone. Original clay models by Randall (and casts made from them) all carry my impressed model numbers, paw-print logo, date of creation, signature casting number date are inscribed by hand on the back of every cast. QUESTION: Aren't these too heavy for my plasterboard wall Randall? By no means! keep in mind- your walls weigh thousands of pounds and support the roof. HOWEVER- do not use plastic or self adhesive picture hangars of any kind, or try to simply put a screw into the thin sheetrock-these will not hold, and are not designed to. Install your mounting hooks or other hangars into the solid wood STUD inside the wall, these are spaced 16" apart. You should use an anchor rated to hold at least twice the shipping weight of the sculpture. To show what a sheetrock wall can hold, here is a photo of two shelves I installed on my bedroom wall for original sculptures that I couldn't mount any other way, the brackets are screwed into the wall studs with 3" screws. The weight for the stone and terra-cotta shown-the top shelf; 175# and 125# for the lower shelf- 300# total. Entire web page and photos are Copyright © 1999-2018 Randall's Urban Sculptures Collection. Permission to repost, "pin" or hotlink photos on any other venue, including but not limited to Pinterest is forbidden, all rights reserved.